My first Allen Elishewitz custom folder was this Omega folder… after wanting one of his folders for as long as I could remember, I finally got one. Allen Elishewitz was a legend in my mind, with all his collaborations with Benchmade in the beginning, when collaborations weren’t as common as they are now. His designs really struck me as beautiful and functional. Now that his relationship with Benchmade has disolved, and he is partnered with CRKT, I no longer want to own his production knives since I find that CRKT knives, though well designed and assembled, do not use the top notch materials which I demand in a knife, and the fact that they are made in Taiwan does not appeal to me.. as much as I like the country. 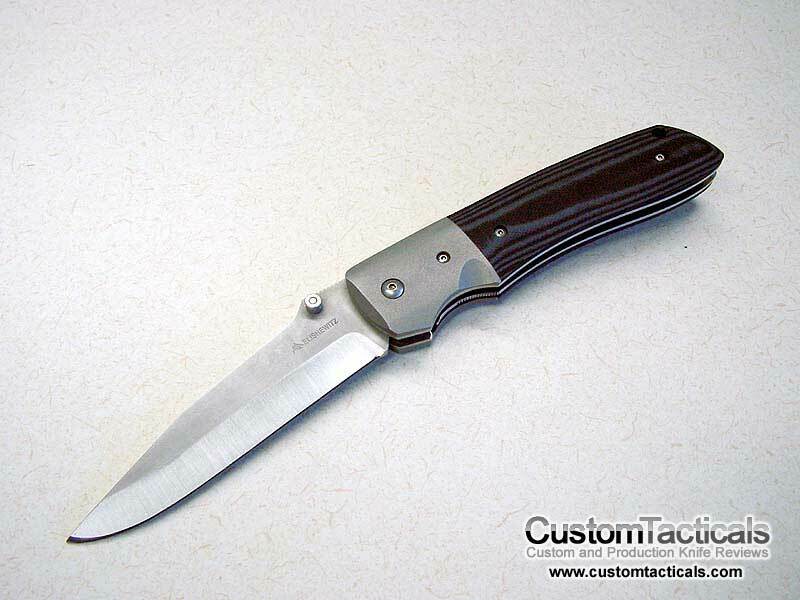 This Omega folder is one of the larger ones from Allen and like most of his knives are designed with self defense in mind. I’m not sure how that factors into this knife design, but it apparently does. I’m not well versed in Bladed Martial arts so I would not be able to say. The knife has great fit and finish and lock up not good when I received it second hand. I sent it back to Allen for a tune up and asked if he could refinish the blade and handles for a price. He sent it back with the handle refinished and added a new larger back stop for the blade so the lock would engage properly. He did not refinish the blade however and said that it was his policy not to refinish them… I could not remember the reason. I really wanted the blade refinished because the bead blasted flats were kind of scuffed and dirty looking. But I couldn’t complain for $20 return shipping! The knife came back in great shape as far as the cleaned up bolsters and liners were concerned, and lock up was solid. The blade had a slightly angled alignment to the handle kind of like a gun grip, but much more subtle, which I think was for self-defense functionality. The blade is double hollow ground and has a satin finish on the grind with blasted flats. Allen was one of the first makers to use mixed finished on the blades and this is one of his earlier examples of it. 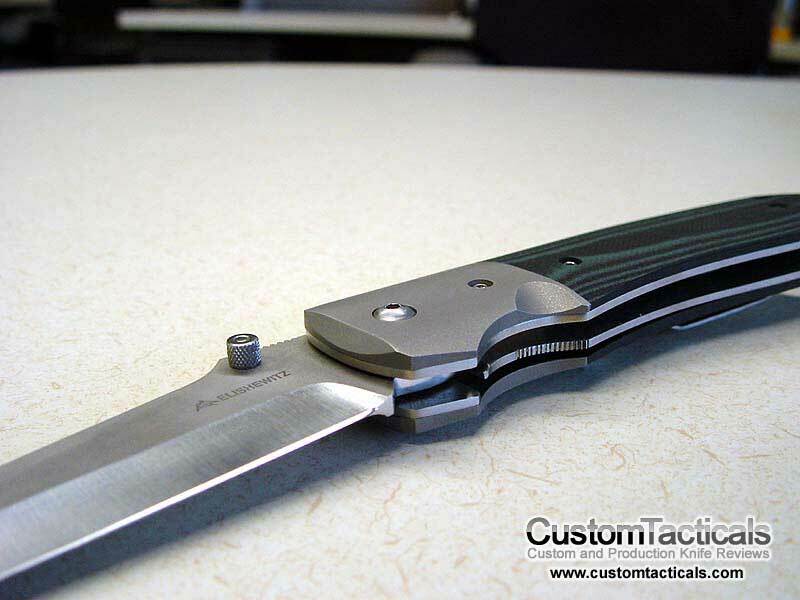 Overall a nice blade, that you can get for a fraction of what a current Elishewitz costs. Not as refined, but still a very nice blade.